Eat the Sky, Drink the Ocean! It is a strange and wonderful object. I can almost guarantee you've never seen anything else like it. 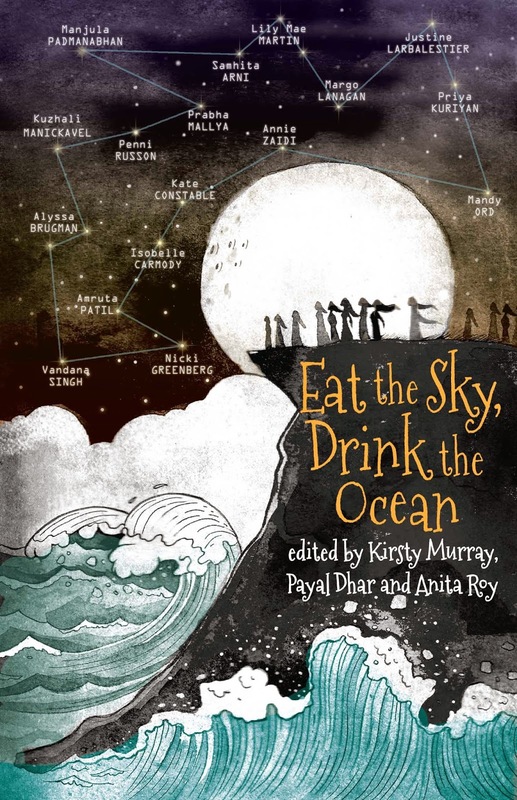 It's a collection of speculative fiction (science fiction and fantasy), a glorious bundle of collaborations between Indian and Australian writers and artists. Each of us was paired with an artist or writer from the other continent. Each pair found their own way to work together -- through email or Skype, shooting messages back and forth. The only other time I've worked in collaboration was when Penni and I wrote Dear Swoosie together. (I wrote about this a little while ago.) But I've never worked with an illustrator before. What I found weirdest, but most weirdly satisfying, was that as Priya's illustrations arrived, I was able to cut back on my words -- she was expressing what I'd written so beautifully that my descriptions became simply unnecessary. I think the final word count was about 25% of the original draft! Another unexpected effect was that my story started out as quite a murky, depressing piece; but Priya's vision transformed it into the most beautiful, uplifting story. I can't wait until you can all see this unique, extraordinary creation for yourselves. I'll let you know when it's available! Evie was a little bit offended when she read my last-but-one blog post and saw my reference to 'those damn cat books,' ie Erin Hunter's Warriors series, which is probably singlehandedly responsible for her literacy skills at this point. I suppose Warriors have been to Evie what the Famous Five books were to me - compulsively readable, seemingly endless, slightly despised by smug adults. So she's set me a challenge today - to write down everything I know about Warriors (without consulting Google! ), and she will correct me with her own comments later today. The Warriors are a collection of warring clans of wild cats, who live in the wilderness in an English-y landscape. One group live in the woods, one by the river, one on the moor etc, and they are named accordingly eg Riverclan, Windclan...um... Treeclan?? (I know that's not right.) (ThunderClan. Not TreeClan.) They fight over territory, but they do share a common mythology based around Skyclan, (StarClan, SkyClan is the fifth clan that were banished.) which is composed of the spirits of dead cats. When you die you join Skyclan, and you stay there as long as some living cat can remember you. After that, I don't know what happens. Maybe you get reincarnated? (Sometimes, yes.) Sometimes Skyclan cats communicate with living cats through dreams. The cats have nature names: Brackenwing, Firestar, Fernwind, (Warriors aren't supposed to have names that contain things related to clan or sacred things) that kind of thing. A cat might start out as Foxkit, become Foxpaw as an apprentice, and finally be given the full name Foxtail. And I think that's all I know about Warriors!